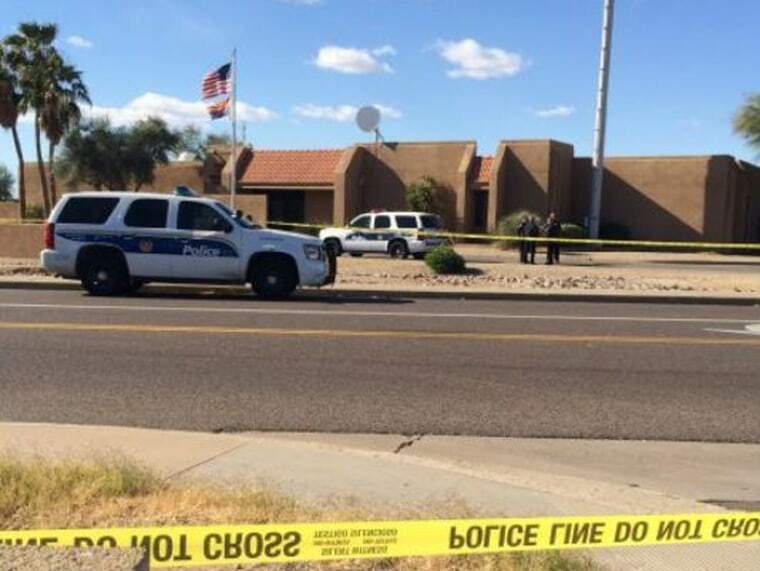 Phoenix police killed a man outside a precinct headquarters after he threw what appeared to be rocks or bricks at two officers, a police spokesman said Sunday. Relatives of the dead man, Lonnie Niesen, 41, told detectives that when they last saw Niesen on Saturday morning, he was making "suicidal statements," the spokesman, Jonathan Martin, said in a statement. Niesen's family could not be reached by NBC News. The incident began at 11:45 a.m. (9 a.m. ET) Saturday after Niesen lobbed an "object" at a sergeant's vehicle that was stopped at a traffic light outside a precinct headquarters north of downtown, Martin said. "The sergeant felt an object strike his marked police car," Martin said. "He looked and saw the suspect screaming at him." After requesting assistance, Niesen gathered more "rocks and/or bricks" and walked to the parking lot, Martin said, adding that Niesen then hurled more rocks or bricks at the building, shattering glass in the lobby. When a second officer ordered Niesen to drop the objects, Martin said, he refused "and suddenly turned to the officers and threw a rock/brick." As the object struck the officer's hand, Martin said, he fired a single bullet, striking Niesen. He died at a hospital. Niesen's relatives also told detectives that he stole a gun and a bottle of alcohol Friday, although he returned the weapon Saturday morning.